The islands of the Bahamas are one of the few success stories in the world of shark conservation. Because of protective initiatives over the past quarter decade, the region’s shark populations have remained far healthier than in most of the world. And in 2011, the island nation became one big shark sanctuary, banning shark fishing in the surrounding waters. The Bahamas are now one of the best places on the planet to see sharks in their natural environment, which has naturally drawn a lot of shark tourism, which in turn has lead to more money and attention to shark conservation. 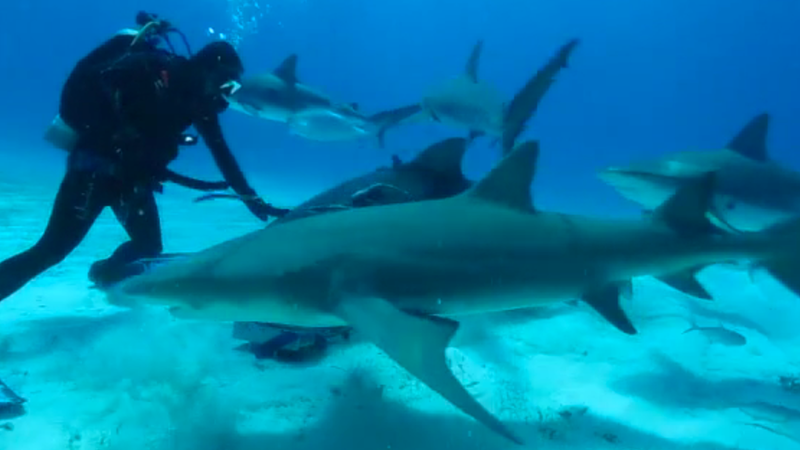 Fusion’s environmental correspondent Nicolas Ibargüen traveled to the Bahamas to explore whether ecotourism could be the key to saving the world’s sharks. A study released in 2017 suggested that shark tourism generates over $100 annually for the Bahamas. During his trip to the Bahamas, Ibargüen met with shark conservationists, tourism organizers and even former shark fishermen, who all explained the benefits of the burgeoning eco-tourism market. “We have the richest shark population in the world here, the most diverse shark population in the world,” explained Stuart Cove, founder of one of the largest diving operations in the area. “We have shown that they [sharks] bring in several hundred million dollars per year that are spread out the economy—with hotels, restaurants, shopping—because people come to the Bahamas just to see sharks.” As Cove explains, the conservation of sharks has paid off big time for the Bahamas; a study released in 2017 suggested that shark tourism generates over $100 annually for the Bahamas. Shark tourists in the Bahamas. While it’s true that the sharks pose little threat to humans, the reverse isn’t as true. And even with the Bahamas protections in place, the region’s sharks are still at risk; as sharks are highly migratory species, traveling thousands of miles, it’s critical that they’re protected globally, not just in a few select countries. More countries in the Caribbean are realizing the economic potential of shark tourism. “I believe many of the countries share the same sharks, so, if we protect sharks in the Bahamas, when they go down to Cuba, they get fished,” explained Cove. “Of course, they have a poor country and they have to eat, so, we understand sustainable fishing… [but] the Cuban government now is working to come up with a policy to have sustainable numbers into the future.” Cove explained that as more countries in the Caribbean are realizing the economic potential of shark tourism, more shark protections will likely come. “It is in our best interest,” explained McPhee. “As a result, of what we have done in the Bahamas and a number of other destinations, [people] are now rising up and are actually putting in place this whole shark conservation because they see it in their best interest."